RP44125 is rated 4.5 out of 5 by 2. Rated 5 out of 5 by gpd52 from Product as described and shipped promptly Product as described and shipped promptly. Would order again. Does this come in the oil-rubbed bronze? I need this replacement part but the only two options to choose from are chrome and brushed nickle even though I selected replacement parts from the oil-rubbed page... Does this come in that color but just isn't listed...? Thank you for your question. Peerless Faucet model # RP44125 is available in the Oil Rubbed Bronze finish. The model number is RP44125OB. Doesn't Delta have a lifetime warranty? I have kitchen faucet, model #29184 in oiled bronze. The cradle for the sprayer broke and I need a replacement. RP44125 is the repair part. I need to replace the spray and hose assembly for Model B4410LF-SS which replacement do I need. You are showing 2 different ones. Is there a part # for the piece on the sink that the sprayer sits in? Thank you for your question. 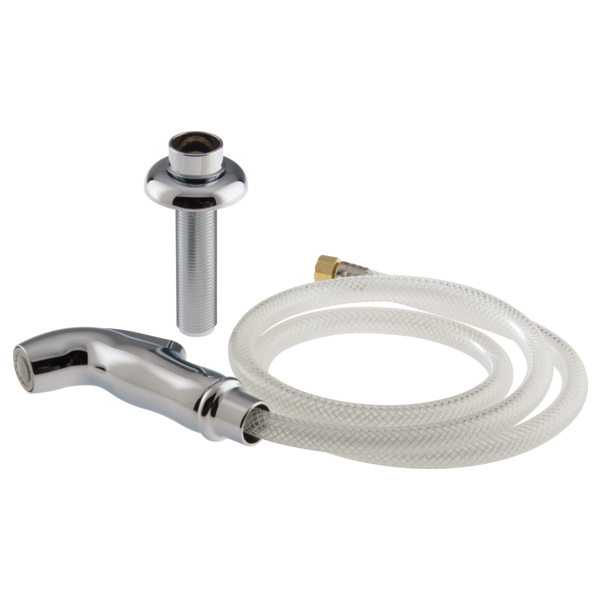 Peerless Faucet model # RP44125SS is not available in separate parts for purchase. If you are having an issue with the spray support and are the original owner, please contact our Home Owner/Warranty line at 800-643-8667. Do you have a version of this sprayer with a longer hose? Is the RP44125 the same as the RP44125 from Peerless? Thank you for your question. Peerless Faucet model # RP44125 is available in 3 finishes-Chrome, Stainless Steel and Oil Rubbed Bronze.